Vietnam faces significant risks to multiple natural disasters such as floods, typhoons, droughts, and landslides. Approximately 60 percent of the total land area and 71 percent of the population are at risk of typhoons and floods. Vietnam’s average annual direct economic losses from floods and typhoons are estimated at 0.8 percent of its gross domestic product—the third-highest percentage among the member states of the Association of Southeast Asian Nations (ASEAN). As part of the World Bank’s effort to support the Government of Vietnam in dealing with these challenges and strengthen financial risk management of public assets against natural and climate disasters, the Disaster Risk Financing and Insurance Program (DRFIP) organized a knowledge exchange and exposure visit to Japan. 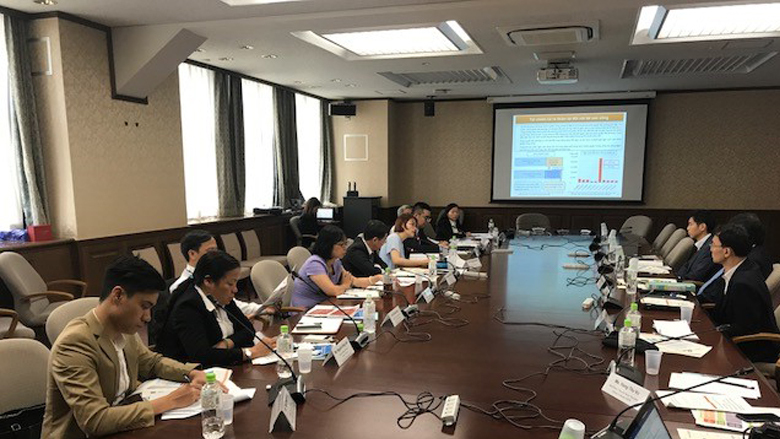 Between July 31 and August 4, 2017, leaders and practitioners from the Vietnamese Ministry of Finance, Office of the Government, National Assembly, visited Japan to share their knowledge and experiences with high-level Japanese officials and practitioners. Financial support for the visit came from the Program for Sovereign Disaster Risk Financing & Insurance in Middle Income Countries sponsored by the State Secretariat for Economic Affairs (SECO) of Switzerland and the Japan–World Bank Mainstreaming Disaster Risk Management Program. The government of Vietnam has long recognized the substantial disaster risks faced by the country, and it has sought to move from an ex post, ad hoc approach to disaster response toward an ex ante approach that proactively manages disaster and climate risks. 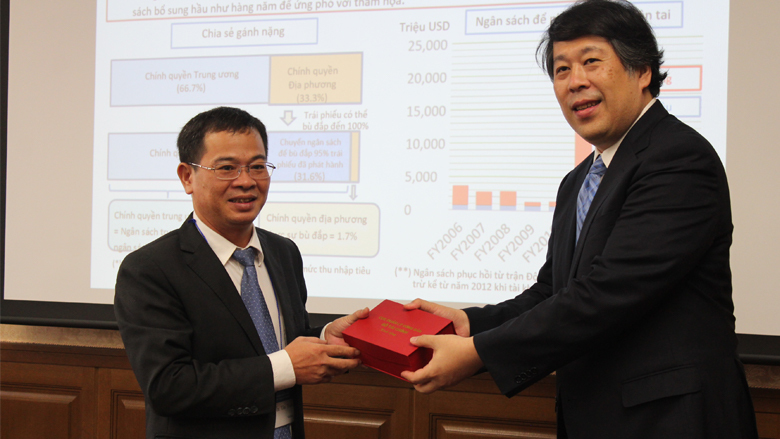 As part of its effort, Vietnam aims to strengthen long-term risk financing mechanisms to decrease the government’s fiscal exposure to natural hazards. The impact of natural disasters on public assets is one of the main sources of fiscal vulnerabilities for the country. In June 2017, Vietnam revised its Law on Public Asset Management, so that public assets that are highly exposed to natural disasters must now integrate financial risk management measures through a combination of financing instruments including insurance. In light of this revised Law, the Department of Public Asset Management of the Ministry of Finance is now upgrading the current public asset management database. 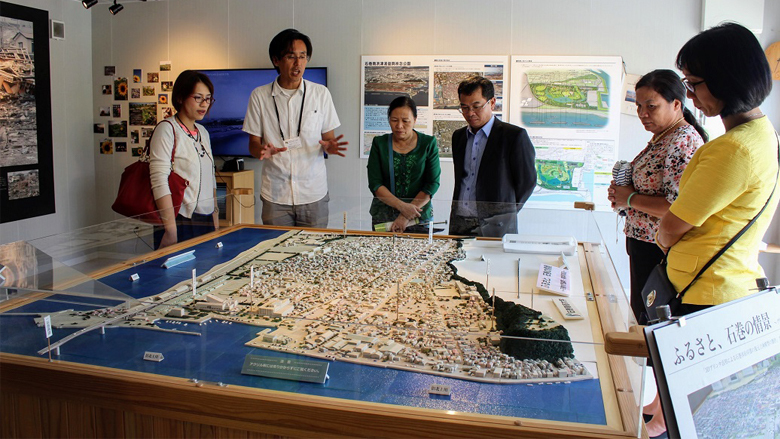 The Vietnamese delegation exchanged opinions with various Japanese national and local governments and private sector, including the Ministry of Finance (MOF) and two regional MOF bureaus, the Kanto Regional Bureau and the Tohoku Regional Bureau; the Ministry of Land, Infrastructure, Transport and Tourism (MLIT) and MLIT Kinki Regional Bureau; the Ishinomaki City government; the General Insurance Association of Japan (GIAJ); and Tokyo Metro. 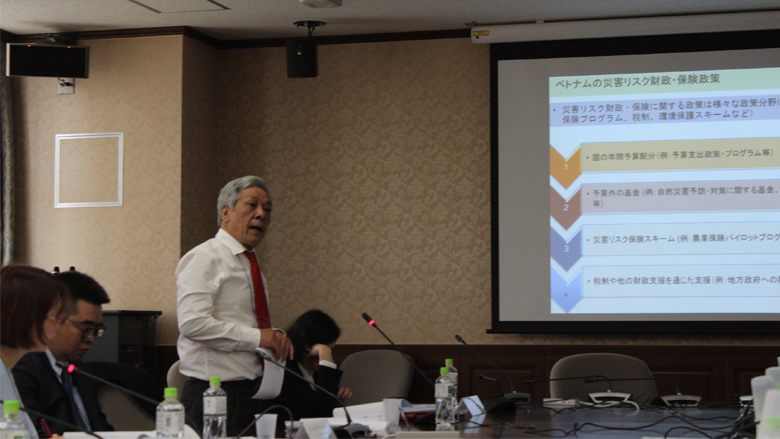 The Japanese MOF provided an overview of DRFI policies for public assets, emphasizing the importance of high-quality infrastructure that is resilient against natural disasters, as well as ex ante disaster financing mechanisms. The MOF also highlighted the legal and institutional framework for state asset management and a centralized asset database system. In addition, Japanese MOF introduced regional risk pooling initiatives including the Southeast Asia Disaster Risk Insurance Facility (SEADRIF), which was welcomed in the joint statement of the 20th ASEAN+3 Finance Ministers’ and Central Bank Governors’ Meeting in Yokohama on May 5, 2017. Japanese MOF invited Vietnamese MOF to explore the potential of joining the SEADRIF as an option to complement the existing disaster risk financing instruments in the country and strengthen financial resilience. MLIT focused on critical infrastructure asset management, including database management. The meetings with local offices of Japanese MOF and MLIT enabled the delegation to study the roles of the local offices in managing public assets. GIAJ shared its experiences in insuring infrastructure assets and advised the delegation on how Vietnam could develop an insurance mechanism for its own assets. Tokyo Metro highlighted the role of an efficient and resilient transportation system in urban areas such as Tokyo and Hanoi. Field visits enhanced the learning experience. 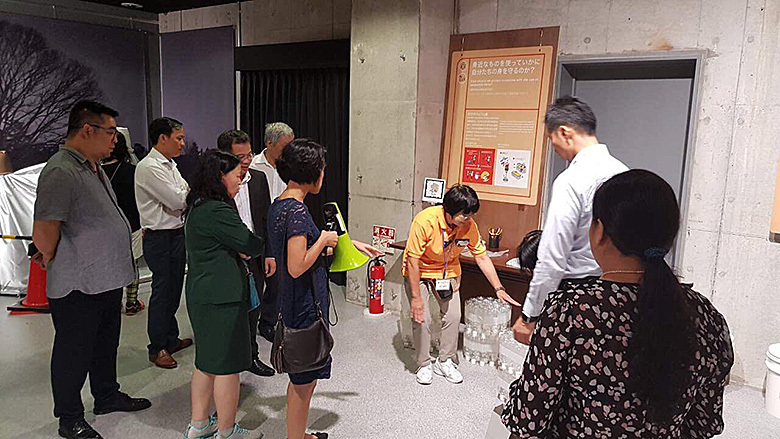 At the Tokyo Rinkai Disaster Prevention Park and Kyoto City Disaster Prevention Center, the delegation was shown how the national and local governments raise public awareness of disaster risk prevention and mitigation. 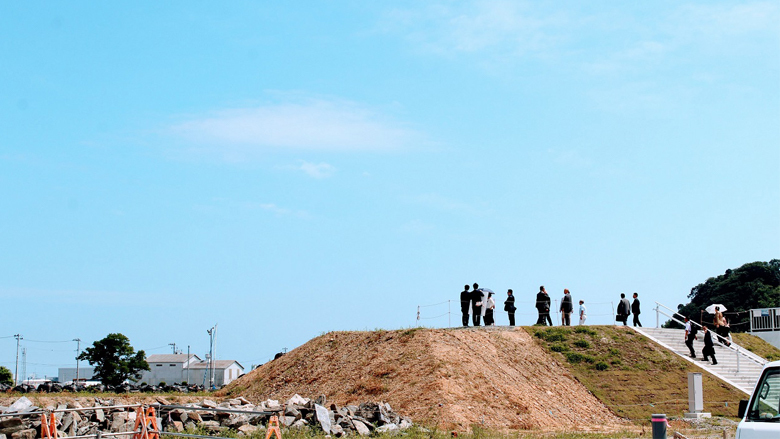 In Ishinomaki City, Miyagi Prefecture, which was one of the areas devastated by the 2011 Great East Japan Earthquake and Tsunami, the delegation visited the field where the concept of “Build Back Better” is being realized: visitors saw government buildings that also serve as evacuation sites in the event of a tsunami, relocated homes, a seafood market that provides a space to connect local businesses with customers and tourists, and a community center that supports the reconstruction process and communicates Ishinomaki’s experiences with the earthquake and tsunami to future generations.
" This visit allowed me to check and confirm my thoughts on how to further advance and implement financial risk management against disasters and upgrade our public asset database systems. I and all members of the delegation have obtained many useful knowledges, impressive experiences and emotional feelings as well. These things would be much helpful for us to build policies and strategies on disaster risk management to public assets "
" I was impressed by the persistent and vibrant discussions with the Vietnamese delegation. Disaster risk management through effective financial mechanism is an urgent and high-priority policy item for both Vietnam and Japan. I do hope that we will stay in touch and work together in our both bilateral and multilateral context such as APEC and ASEAN+3, with the assistance from our colleagues at World Bank. " The delegation members are excited to take various ideas for further contemplation and action back home and applying them to developing regulations, enhancing public asset management, and upgrading the public asset database under the new law system. Furthermore, in October, the Vietnamese MOF will host the Vietnam Finance Conference, at which solutions to enhance public asset management system including financial risk management against natural disasters will be discussed. This event will allow the Vietnamese MOF to raise awareness of this agenda—including lessons learned from Japan’s experience—with wider stakeholders in Vietnam. The Disaster Risk Financing and Insurance Program (DRFIP) helps developing countries address the potentially high cost from disasters and climate shocks. DRFIP provides analytical and advisory services, convening services, and financial services to over 50 countries worldwide to support the development and implementation of comprehensive financial protection strategies against climate and disaster risks. To view an introductory video on disaster risk financing, click here. For more information, visit http://www.worldbank.org/drfi. Switzerland’s State Secretariat for Economic Affairs (SECO) and the World Bank’s Disaster Risk Financing and Insurance Program (DRFIP) have developed a joint program to support middle-income countries (MICs) in building their financial resilience against natural disasters since 2012. The program provides selected middle-income countries with tailored advisory services and institutional capacity building for public financial management of natural disasters. The program is managed and implemented by DRFIP. The Japan–World Bank Program for Mainstreaming Disaster Risk Management in Developing Countries, launched by the Government of Japan and the World Bank in 2014, supports technical assistance, pilot projects, thematic initiatives, knowledge mobilization, and capacity building along the four pillars of the DRM framework described in the Sendai Report. The program is managed by the Global Facility for Disaster Reduction and Recovery (GFDRR) and implemented by the Disaster Risk Management Hub, Tokyo (DRM Hub, Tokyo). Cat Risk Tools Now Available!